Hi guys, I was talking to someone on skype and they convinced me to start posting pics of my projects again so here's one for you. 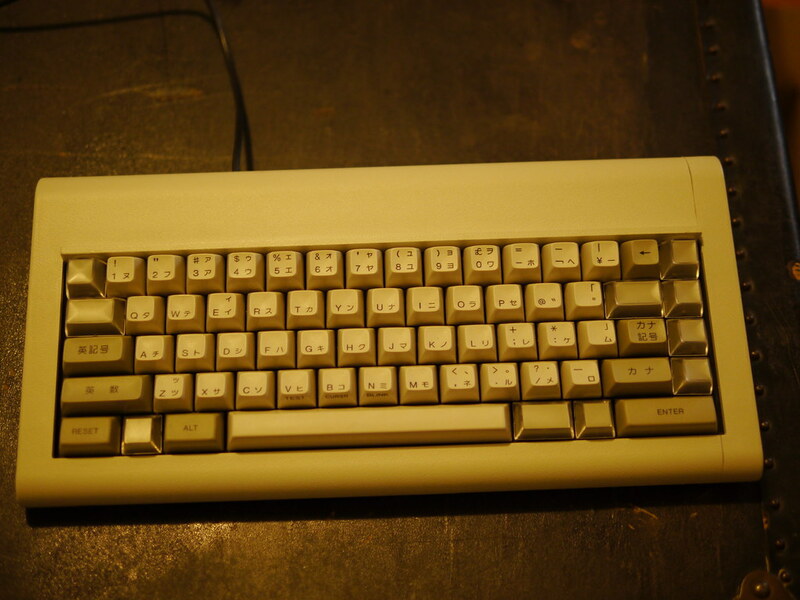 I love the IBM Chinese / Japanese keyboards (6112884 for Japanese, 6113442 for Chinese). Mendleson's has like a huge stash of them, they are NIB, IBM, tee mount (green) alps, have NKRO, and are also cheap. How cheap? $25 NIB IBM Alps! Everyone should own one. Soarer even made a controller code for it, which was sweet. Unfortunately they are huge. I decided to fix that. What did I do? I cut the last two "sections" off the plate, cut a section out of the bottom case, cut a different section out of the top. I'm very glad I was able to preserve the places for the feet to clip back in as well as the speaker grill. I spent many hours filing the 4 edges down to match together perfectly, or as good as I could get. Then I decided whether to keep the PCB or not. 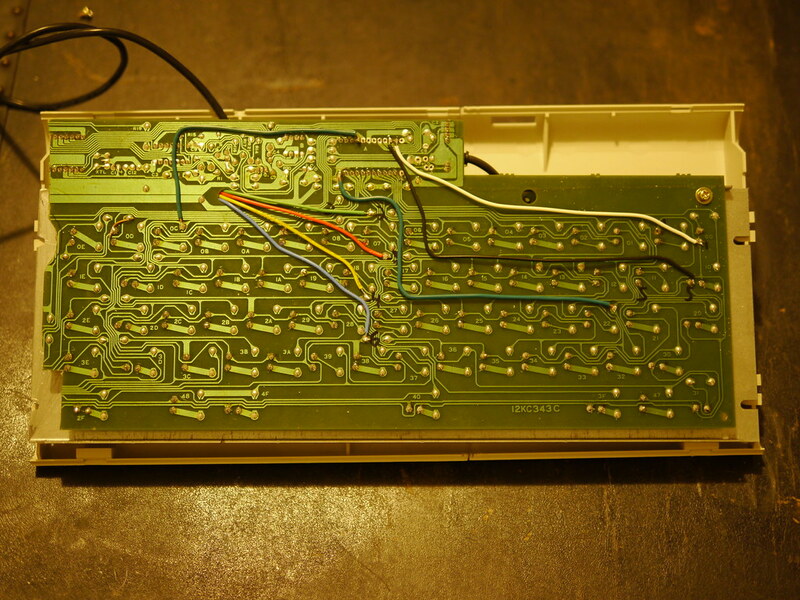 The original PCB had NKRO, but the controller was on the part I cut off. I also really like the lowpoly-type M0110 mod where it's just direct wired, but I still need a place for the controller. hmm. I ended up keeping the PCB. 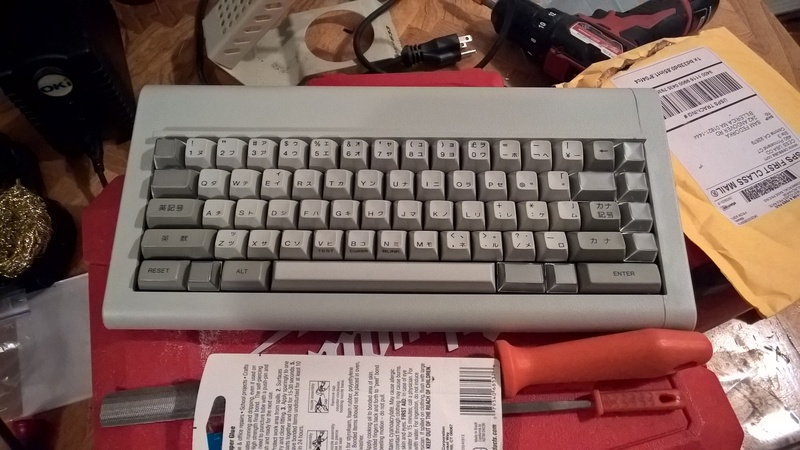 I cut it down to size, desoldered the mux chip driving the columns (which was on the part of the KB that was left) put a teensy there, fixed a few traces to power the teensy, repaired all the traces that were cut, mapped out the matrix, came up with a layout and bam! 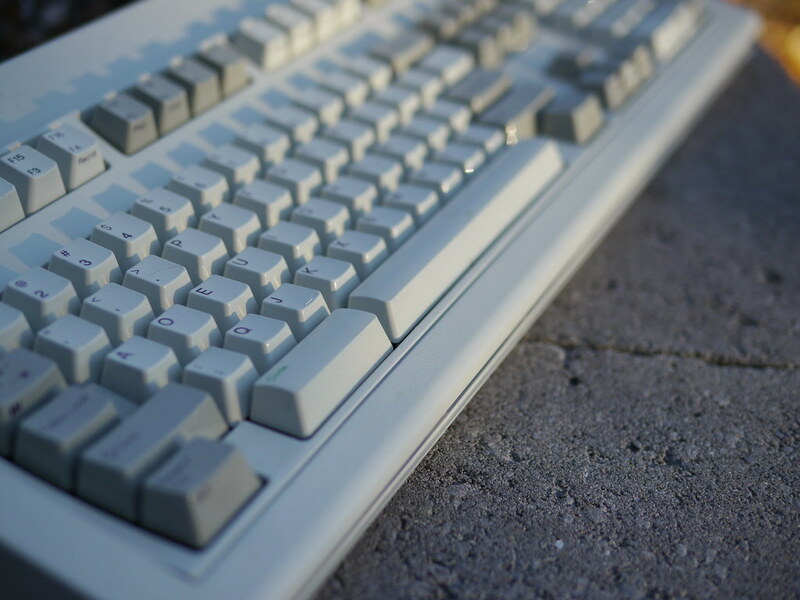 The KB is sometimes known as the pingsaver keyboard. Since I desoldered mine I can confirm that it's the metal plate that makes the ping. This ping has been preserved in this iteration which is good 'cause I love it. The tee mount alps actuate very high. Most people consider them linear, but I've always thought they were a little tactile. 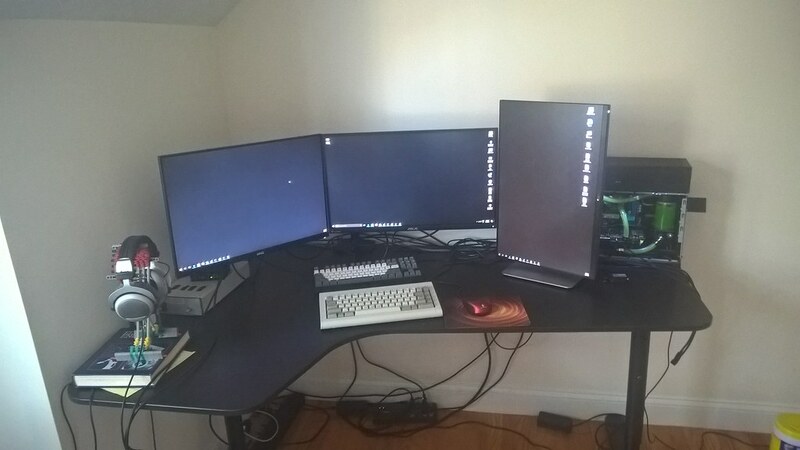 I use it for gaming or my "left hand only" ergodox depending on how I'm feeling. Here are a couple of cellphone photos I took, I guess since I have a post now I'll take some interior shots too. This is the only shot of the internals I could find. Again missing any sort of wiring as it's an early photo. I guess I'll take some photos and upload them later. Enjoy! Here it is with the top off (oh my!) you can see the bright wires, which are the columns from under the board. This teensy used to be in the IC socket and therefore was missing some pins for that purpose. I found it easy and elegant to fix it this way. I also preserved the internal strain relief for the cable which was pretty legit. The speaker plugs in and does work if I connect it to the teensy but I opted against. I had to route the colored ones in between switches between the PCB and plate. Close up on teensy wiring and USB cable. I did have to slice the USB to get it to fit in between the jacks, but I think it worked out pretty well. I considered repurposing the data jack (the upper one. Lower is for speaker) but that would involve tapping the two USB data pins from the teensy and would be a lot more work. 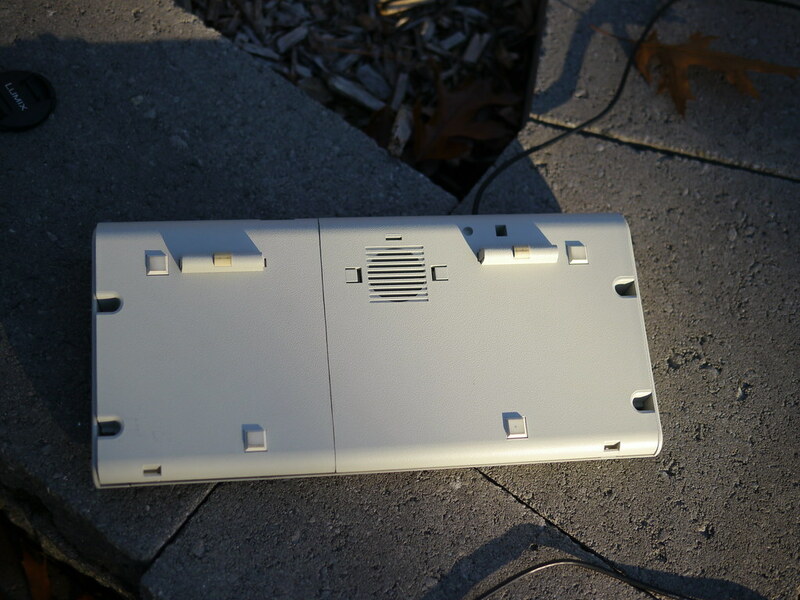 Underside of the keyboard. All rows are labelled. The green wire on the left "moves" that column to a different teensy pin somewhere on the top. I think that was the LED pin or something because I was having issues with that column so I moved it. The jumper on switch 0D adds 0E to that column, so I wouldn't need another wire there. 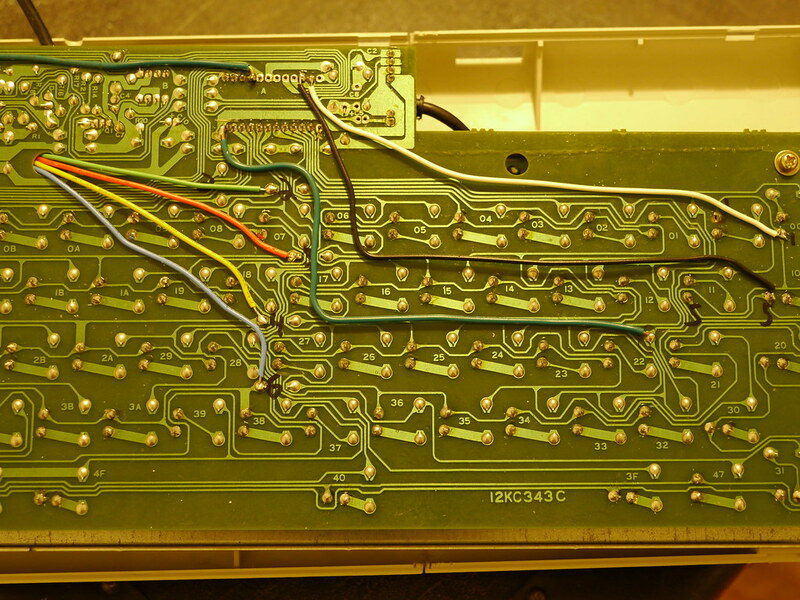 The green wire on the left is to "move" the first column there. On the teensy that pin is for VCC which I couldn't feed into my KB, so I sliced it (if you zoom in you can see an X I put there to mark it) Then I sliced the trace for the lower left pin, which is power for the mux chip that used to be there driving the columns, the wire "moves" column 1 to that pin, solving 2 problems with one wire. 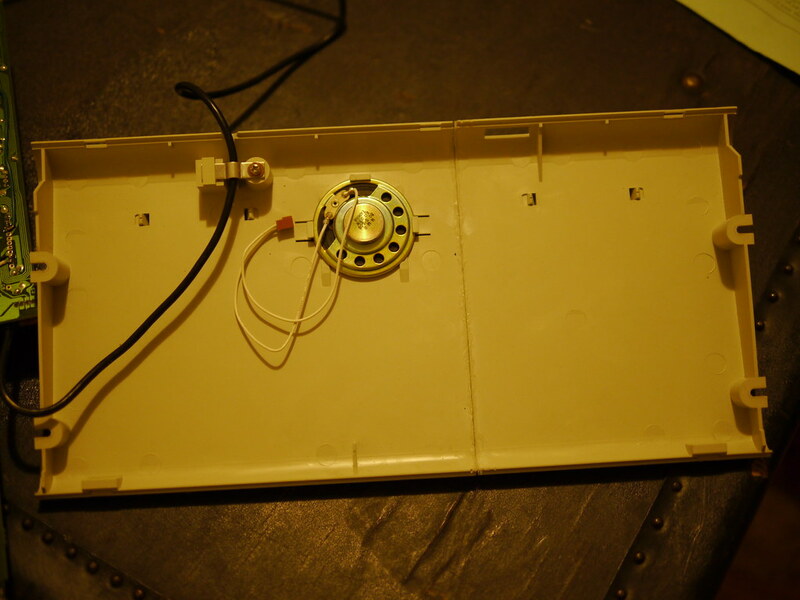 On the bottom we see the speaker in place and the lower seam. in the middle of the lower edge, I had to remove a clip that interfered with something. You can see two upper edge clips on the left that do still mate, but the right one does not due to asymmetric cutting. On the lower, the left clip matches and the right does not: same reason. The large hole on the middle right is for the volume knob on the KB that no longer exists. Here is the "seam" on the inside of the top. Again it is asymmetric: the top "cut" is at the end of the KB shelf, and the bottom one is moved a few mm inward from there for better strength. Its hard to see, but I had to cut a case locking "tab" off. it used to exist on the far right edge, where that little box is. 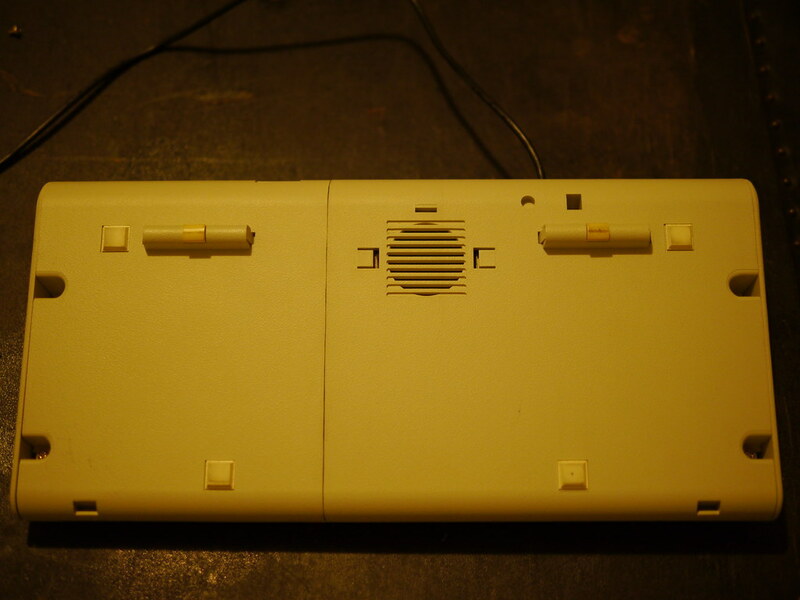 It mounts to the hole near the key marked "enter" on the keyboard behind. I also had to slice another tab on the top left edge, which is near the alt key. you can see what locking pieces no longer exist in this shot as well as how closely I was able to align everything. I actually cut and filed it flush by hand (over the course of several months, probably at least 10 hours of effort) then filed it inward to make a "v" shape for the glue to fill. I plan to add more later, but it's holding just fine now. OK that's all for now. I'll put up some decent shots once I have light again. I've been looking for something to do with my one of these. I might just convert it to USB and use it as a conversation piece. Who knows. Wasn't there another board that was known as the Pingsaver? Anyway nice project! Nice mod and thanks for sharing this great find, for me, shipping to Europe costs 60+ USD though. How did you achieve such a clean cut and what glue / method did you use for putting them together? I bought two of the QWERTY/Chinese versions. No Japanese left. One for the wall o' keyboards, and one to see if the GH-122 PCB will fit inside. I don't know when that board was branded but JDcarpe called it the pingsaver back in 2014 https://geekhack.org/index.php?topic=62628.msg1468025#msg1468025 I called them pingmaster in early 2014, but the name never stuck :( The important part is that most of these alps-made tee mount KBs all use the same plate, and that plate makes the noise. 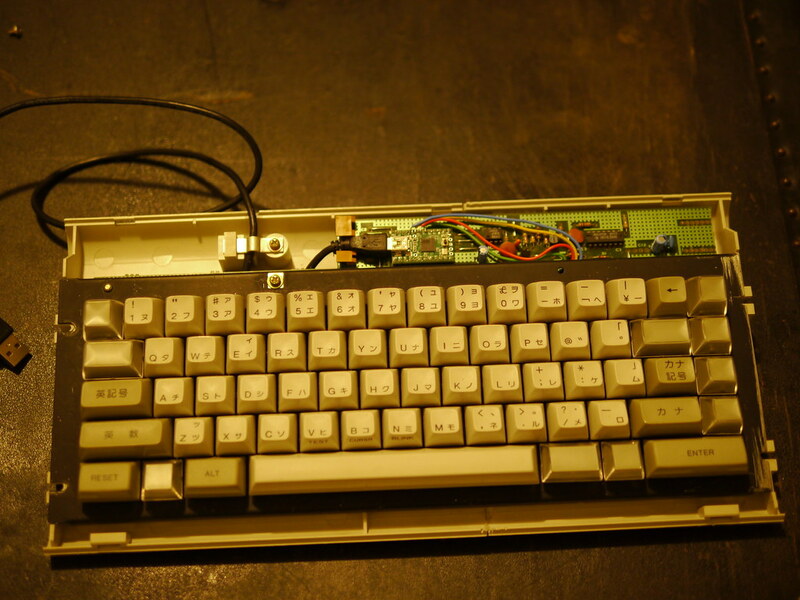 I noticed a similar thing when HaaTa visited me with his box of NIB alps keyboards for his kiibohd project in 2012 or 2013 sometime, but we didn't know that this would be a common theme amongst these keyboards and the pingsaver name didn't come out yet. I wonder why the Apple M0110 isn't like this. My guess is that it's too short. The plate has the ringing / ping sound even detached from everything else. There were some theories as to what caused it, any me theory was pretty wild ) so I'm glad to have put them to rest. Anyway I work full time and also take classes full time so I never saw the sun. I have a half-day tomorrow so I'll take more photos then. added pictures and descriptions of what I did to mod it. using this KB is sorta tough, because the "enter" and right shift keys are 1u over from their normal place. I mapped the extra key to be the same to prevent me from missing too badly. Awesome build!! Good to see you around DV! The thing is, pingsaver is a **** name for this board because it doesn't save anything, and pingmaster is a great name . We might need a retcon here . Dang it! Now I wish I had bought three. One for the Wall o' Keyboards plus two to slice for expansion for the GH-120, including the leftmost two columns. Excellent work! I have one of these (in "uncut" form) and love the modded smaller form factor. Well done! I'll have to check, but I might have kept the bits I cut out. I know I kept the switches. A worthy keyboard for the wall! Yeah, it got named that after the "saver" convention. Spacesaver, "unsaver" (which is another horrible name. 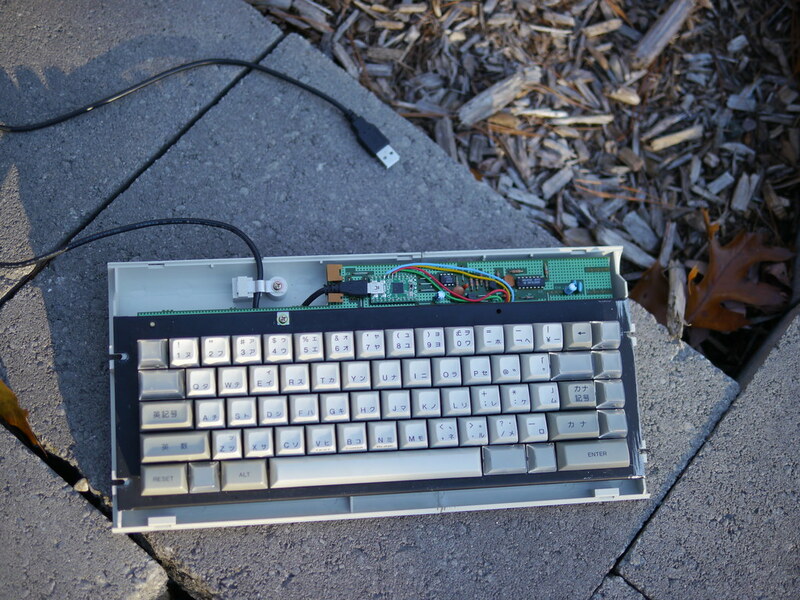 the "space saver of F122's" about the same width as a model M, so it "unsaves" space. Kishsaver is a good name. the list goes on. I didn't like the "pingsaver" for the same reason. It pings if you look at it funny. To use this keyboard truly is to master the ping. Oh, forgot to mention one of my favorite bits! 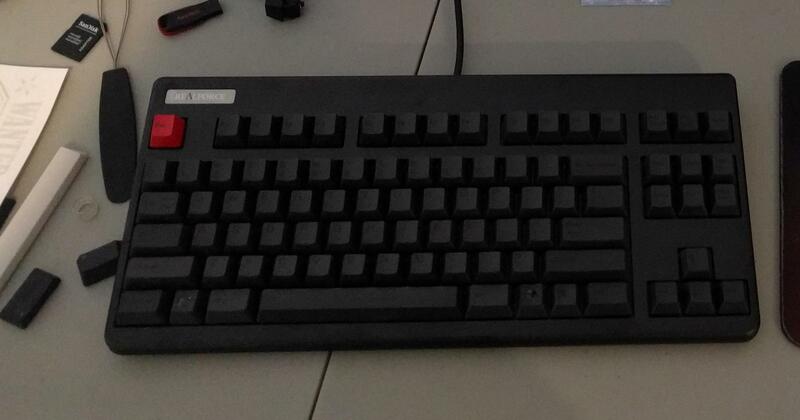 This keyboard has convex keys on the bottom row! I've always been a big fan of that. You can tell I need to have more practice here to get back in the habit. Wow. Such a nice mod. I'm always bummed when I see these, since they are so heavy, which makes shipping them over crazy expensive. I can't say that I understand much of the wiring after one read through the post, but if I wrap my head around it, it might actually come with my AKB-3420. Congratulations, Dork—this has to be one of the more audacious mods in recent memory. I remember you'd been talking about doing this ever since these unique boards appeared. 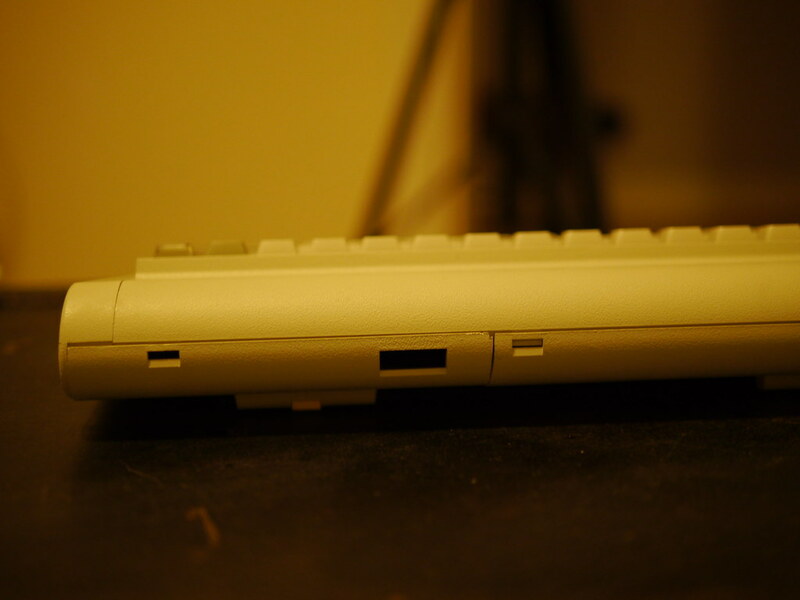 Maybe it's just me, but I'd be tempted to add a cut at the left too, so they'd look like an intentional part of the design, like the slots around a Model M. It'd be purely esthetic, of course. This ping has been preserved in this iteration which is good 'cause I love it. The ping is the thing! It didn't? That's all I've ever called them... It's a lot easier than "IBM Model 6113442" or whatever. 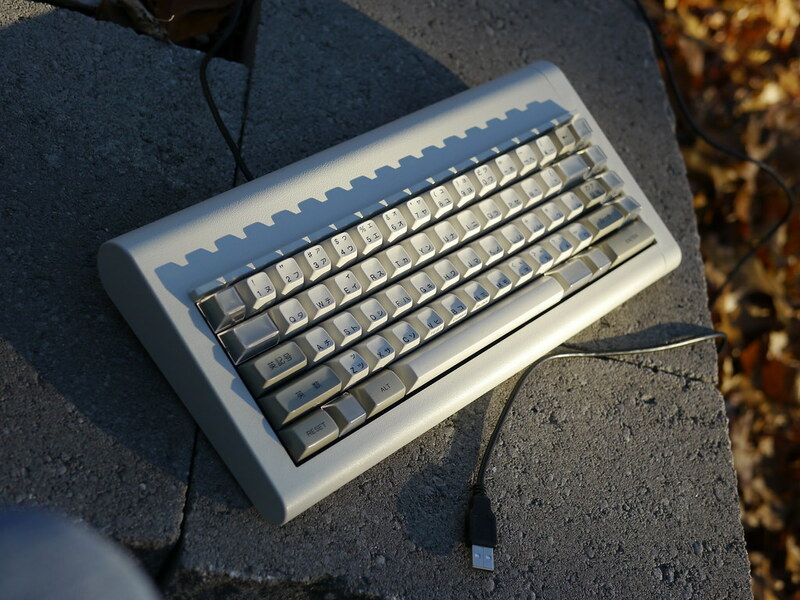 The thing is, pingsaver is a **** name for this board because it doesn't save anything, and pingmaster is a great name :p .
How about Pingmaster Mini then? Dork, any practical way to show us how you mapped this? There are so many possibilities. The thing is, pingsaver is a **** name for this board because it doesn't save anything, and pingmaster is a great name . I meant the fullsize one, actually. Pingsaver is fine for this cut-down version, because it actually saves something xD . Ha, that keyboard is quite high on some people's lists xD . I agree though, centred lettering just has something really nice and retro about it :D .
It has quite an inspiring layout. Ctrl and Enter for the pinky - actually pinky is not that weak. 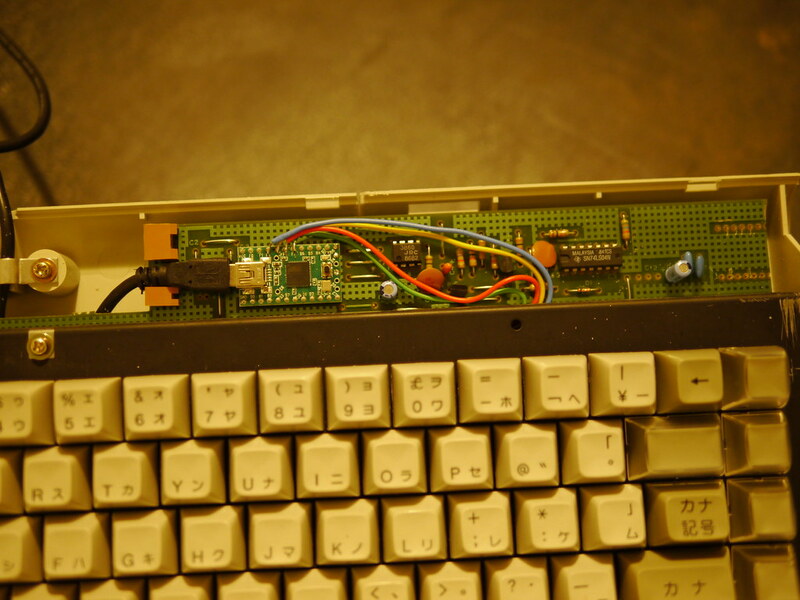 And the far bottom corners are difficult to be reach by any mean, even pinkies - therefore the Esc key. Tab key can be reached by the palm on this profile. beautiful keyboard and great pics, but I wasn't expecting the pics to hit my internet that hard! Took me about 10 minutes to load the whole page, on 5 down! Yeah I got a little carried away and posted the full resolution. This thread has 17 full resolution photos which are certainly a few MB each. I'll go over how I wired it. Just gotta write it up. Fortunately it's not hard. edit: it's pretty easy for a 2KRO KB like yours. A little harder for NKRO but still not that bad. Does take a little work with a good eye and/or a multimeter / continuity tester though. This board is an excellent example because it's got an easy to see matrix, is only one layer but also NKRO. Got my keyboards in today. Very nice - nobody believed they were NIB keyboards. 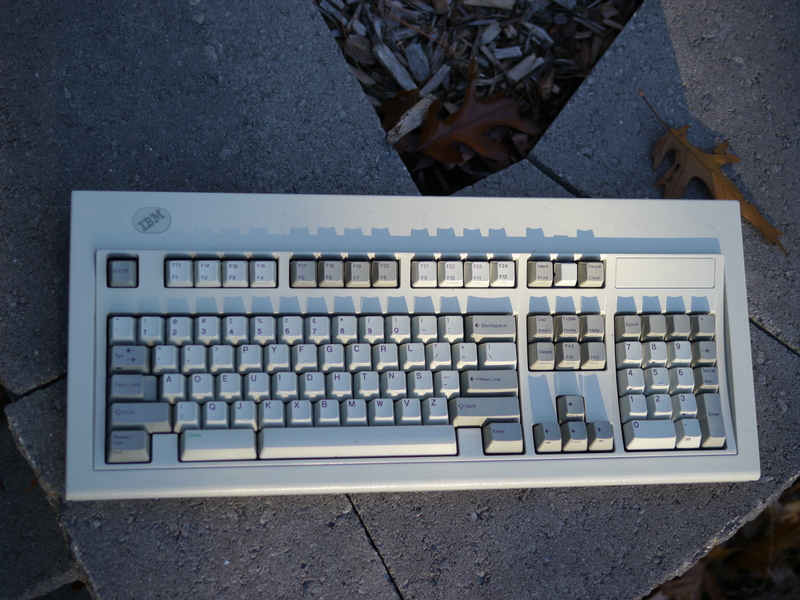 Also, having heard my F-122, many were surprised that this was an IBM keyboard. Anyhow, one is up on the wall o' keyboards already. The other wants to be a project board. I've already verified that the GH-122 PCB will not work due to the extra column on the right of the main block. However, it *might* be possible to move two columns from the right side over to the left, a la the F-122. Then some trimming and Teensy-ing and Bob's your uncle. Anyhow, thanks very much for the find! If you want, I was able to find all the bits I cut out of mine. I'm not sure if it'll help you or not, but they are available. Ron, did you take it apart? I think everything about these keyboards is really over the top. Even the D Backshell connector is rebuildable. I've only seen nicer ones in mil-spec eqpt. Thanks! I have not, due to my new policy of *finishing* one project before *starting* another. However, even from the outside it is a tank. That D connector is awesome. (Gotta post a pic!) I am absolutely going to find a way to embed a USB A connector inside of that. 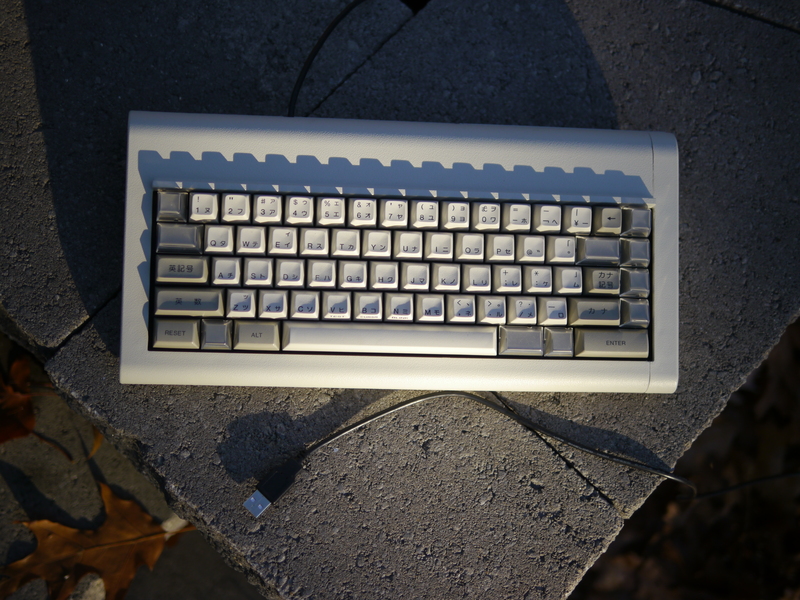 Do you know if the keycaps are just "Alps"? And I have to say, as pretty much everyone else has said about these everywhere on the internet, it really is great. great value. 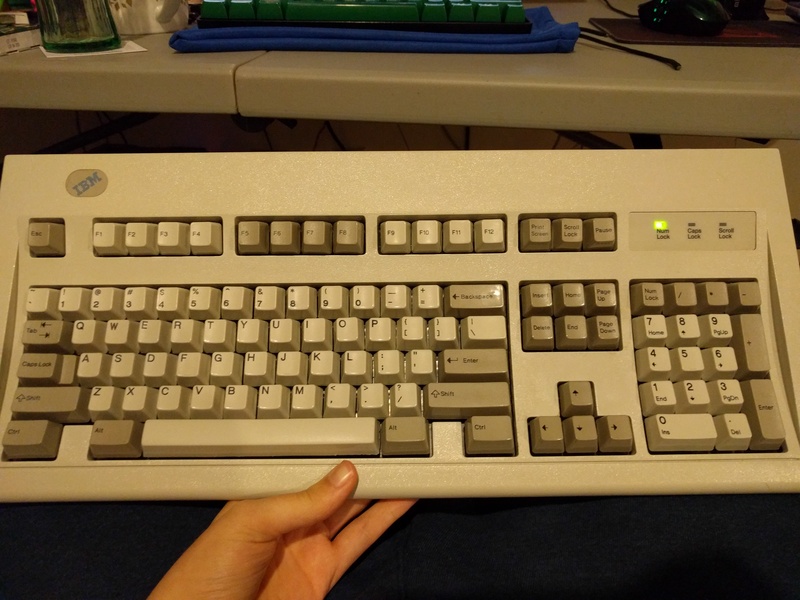 I like nice super tactile clicky buckling springs and mx greens, and, while I am still waiting for a controller to come in the mail, simply typing on it without it plugged into anything the linear vintage green alps just do feel pretty darn nice. They are nice and loud, so while one might not get a satisfying tactile feel, you get a nice satisfying audible experience.... and yes, it does ping (in a rather satisfying way). And as said, it's new, in box! Almost want another one right away just because it feels wrong that they're so cheap and I can't imagine not having more than one while I can. Another pinging endorsement of these boards, get one while you can! Just got mine (also Chinese version) in the mail today, also inspired by this thread. What a great deal. And shipping from Ohio to California was very reasonable. I've never warmed to linear switches, but these are totally worth of respect. And I love these keycaps - what a great feel. Does anybody know if these are comparable to the Topre 104UG HiPro key caps? I don't have topre hipro, but I will compare with SP spherical and also hall effect, which are similar. To me, these are slightly tactile, I've never found them to be linear. At first I bought two, one to mod and one to keep, but I sold one after installing a converter, and then modded the other. 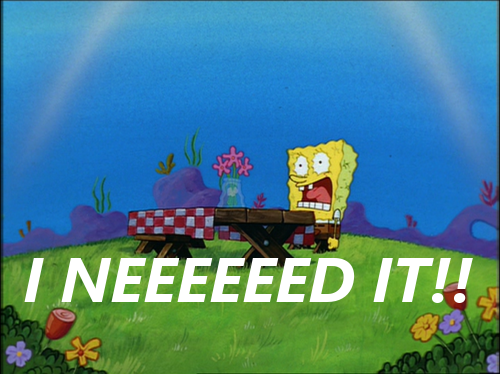 I feel like buying a third to keep stock or at least controller modded (soarer / teensy) but I really can't justify it. 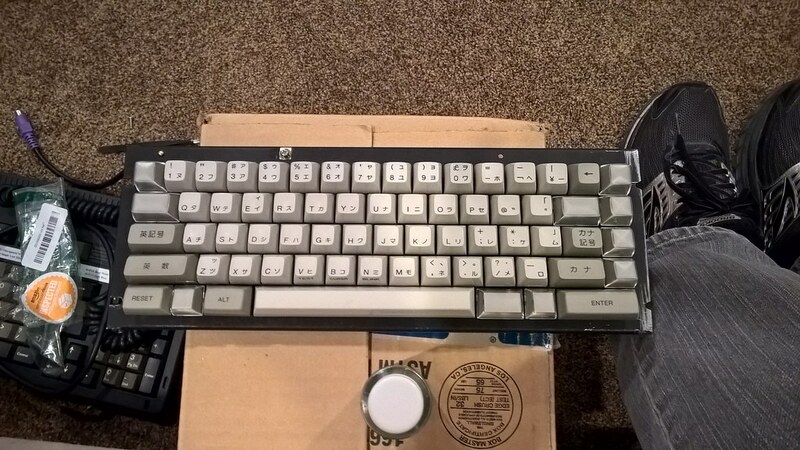 @ron, the keycaps are alps "tee" mount, and aren't compatible with anything else. "normal" alps (z axis or whatever) is different. Yes, if I press slowly, I can feel something that can be described at non-linear/slightly tactile. 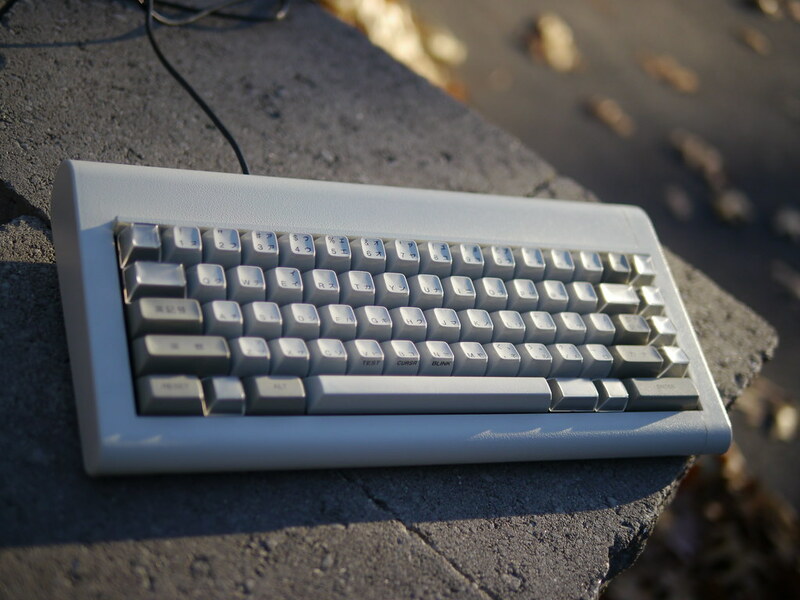 However compared to even MX Browns, it is very subtle. Even with this being the case, these switches are nice, and the key caps are nice too! Correct, all SKCC, SKCL and SKCM switches have this. 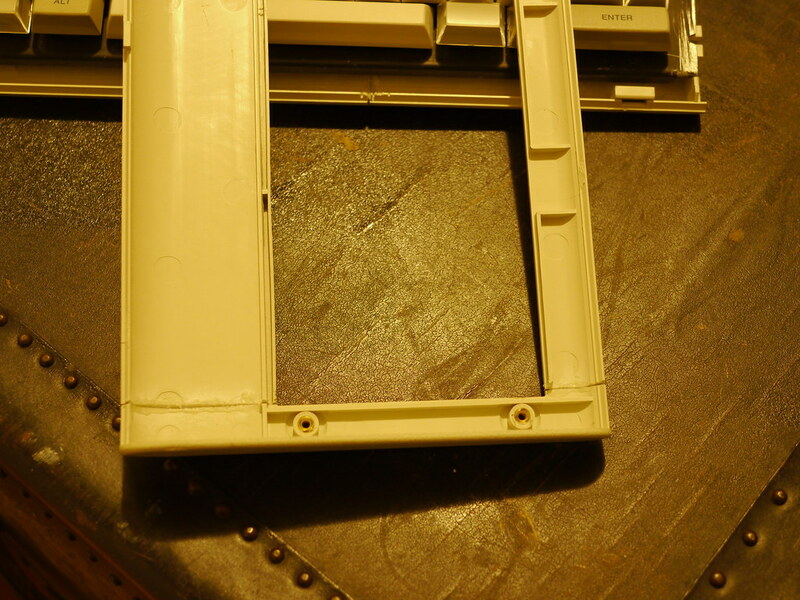 It's caused by the slider clearing the switchplate. It's subtle, but noticeable enough that the "feel" is not like that of other linear switches. Look at AS's Alps force curve and note the dip in SKCL Green and Yellow. Im scared of chopping up a PCB though. Possibly converted to MX, but we'll see. Case first. How neat! I'm tempted to get a second board just to give it the chop. Glad to see you posting again! I feel like it's been a really long time. Just thought I'd mention that there are still some of these left at $34.95 + free U.S. shipping. I saw this in person and it looks incredible. Great job dorkvader. Anyway here's the short version: the matrix supports NKRO, so after you cut the board, you just "repair" all the traces that you cut (for the switches that are still used). Additionally, I realized the teensy is an almost 1/1 drop in for the port expander, so I was able to do a really "clean" mod of it. It would be much easier to just wire up the teensy "floating" (just in the bottom under the PCB, or cable tied down or whatever. Now actually figuring out what the matrix was and how to get it working was very tedious: I used soarer's firmware because I could quickly test new layouts and then just played around with it until it worked. My methos is to map every key to a fn key, a number row key or a number pad key, then use aquakeytest and see what I press and what happens. So if I press "s" on the keyboard and I get F5 then I go and edit the matrix in the config and change "F5 to be "s" repeat until done, then figure out the keys that "don't work" and repair those. (you can see in my work, I "added" them to an existing row and new column, since there was an unused portion of the matrix in that area. I'll write up a little more detail on how I accomplished this, and a bit more about how keyboard matrix circuits work, since to understand this mod, you need a very good grasp of that.